I was reading about the new Wasabi Ultramobile Photo Printer that fits in your back pocket and enables you to produce 2"x3" prints from your mobile phone or via USB connection. The key to this device is a very interesting technology called ZINK paper, which means "zero ink." "ZINK Paper is an advanced composite material with cyan, yellow, and magenta dye crystals embedded inside and a protective polymer overcoat layer outside. When heat is applied in just the right way, full color images appear like magic on the paper." All of this seemed too good to be true. So I did a little price evaluation of the printer and the paper. 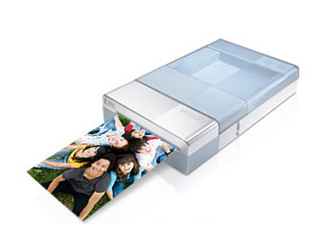 You can get the Wasabi Ultramobile Photo Printer from Dell right now for $99 US, and the paper is available from folks like B&H for $9.99 for 30 sheets. In other words, this seems like an affordable technology. This could be a good device to have in your bag when you shoot events. You could make prints on the spot, or have an assistant to it. If you're a Raw shooter, make sure you capture in RAW + JPEG mode. You can make the prints from the JPEGs and use the RAWs to create the final product. Can it work with the iPhone? Is this the same as Polaroids? That's a good question concerning the iPhone. My gut feeling is no because Apple has limited its Bluetooth to headphones primarily. But I don't know for sure. Also, on Twitter someone commented about the Zink paper: "It's okay, not great. Concept good, contrast range of prints a little low. e. Great for quick proof or gift print." So make sure you read the return policy in case the printer does not meet your expectations. I would look at it as a modern day Polaroid printer. If anyone has experience with Zink paper, please post.